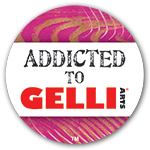 You know me by now – if I see something I am ALWAYS going to cast my eye across my craft room and see if I have something that I can make do with cause I really HATE shopping. I was looking at glassine paper, and the examples of Kraft glassine in Tim’s new book and I thought What do I have that has those same properties? Well DUH! Waxed paper. 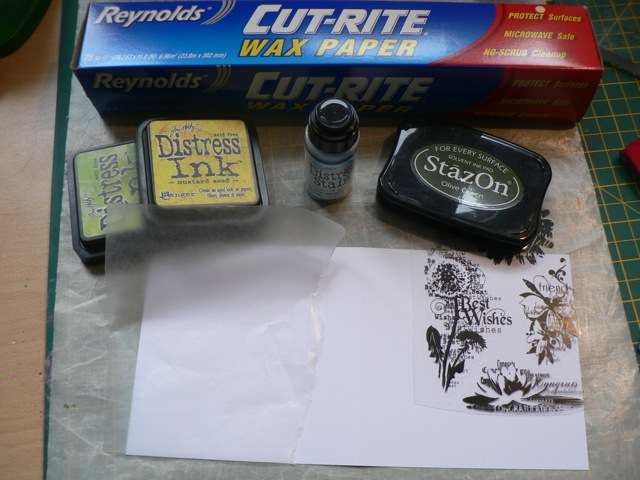 I assembled my supplies – waxed paper, Distress inks and stains, Staz-on (or Archival ink, I expect) and a stamp I have had forever and never used. 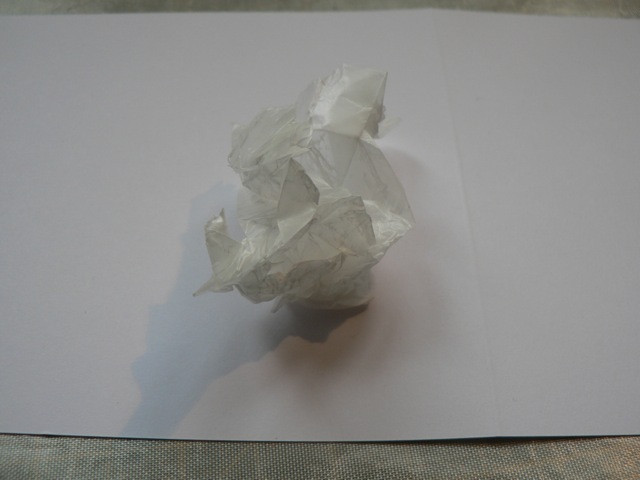 I started by crumpling the waxed paper. You can do it a lot or a little – the creases are what will give you the effect. Open it out and smear on Distress Stains in any colour or in a few colours. 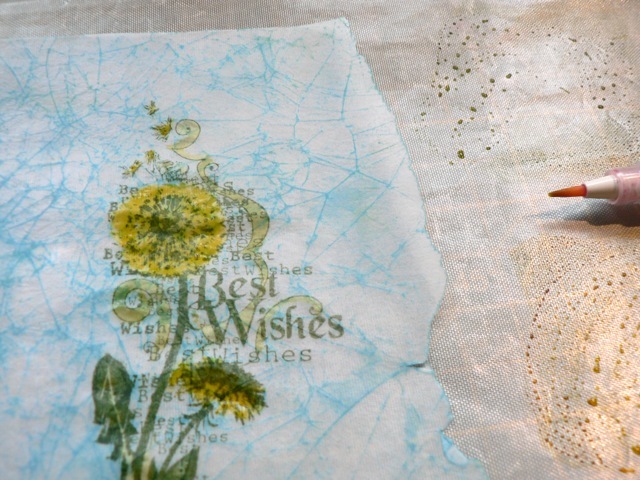 Give it a moment to sink in – you can blot with a paper towel and go over it again for deeper colour. 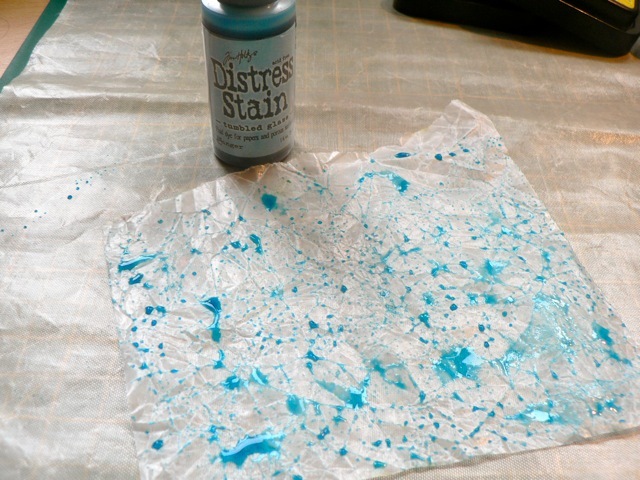 It will bead up on the waxy parts – feel free to work it into the creases with the paper towel. 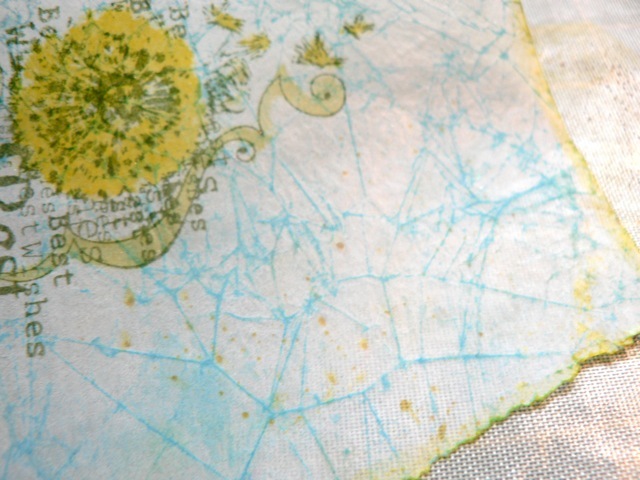 Ironing the waxed paper gives it a sort of flexible vellum-like quality. It is pretty floppy after the ink but it firms up well after you iron it. Stamp your image and colour in the bits yo want with Distress ink and a water pen. Iron it again cause it’ll be wet now. 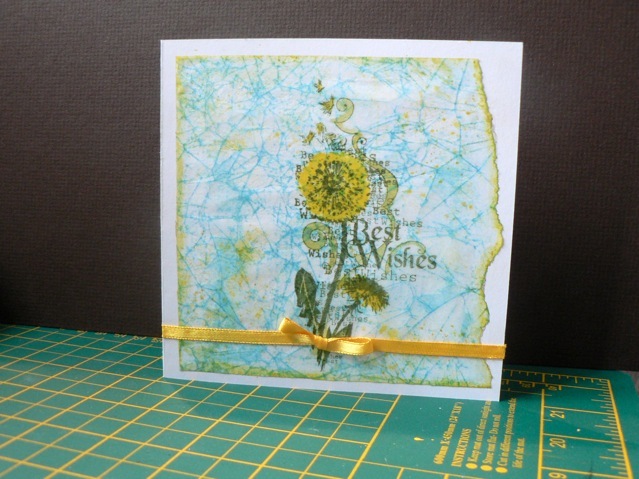 I also tinted the edges and pressed the back into some droplets of watery ink left on my craft mat. I like that effect. I think the next bit will surprise you! How DID I get the waxed paper to stick to the card? 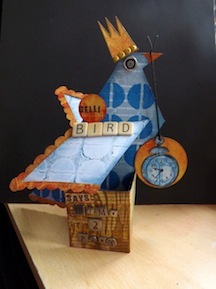 So simple – unlike vellum you really can’t see the adhesive thru the waxed paper. The ATG gun worked a treat! I’ll get to that in a moment. Next I did the same thing with Vintage Photo.Not sure how well you can see, but the left is JUST the stain, as above. The RIGHT has Vintage Photo DI smudged over the surface, after the ironing removed the wax. I doubt you will be able to see this super clearly but I’ll give it a go. 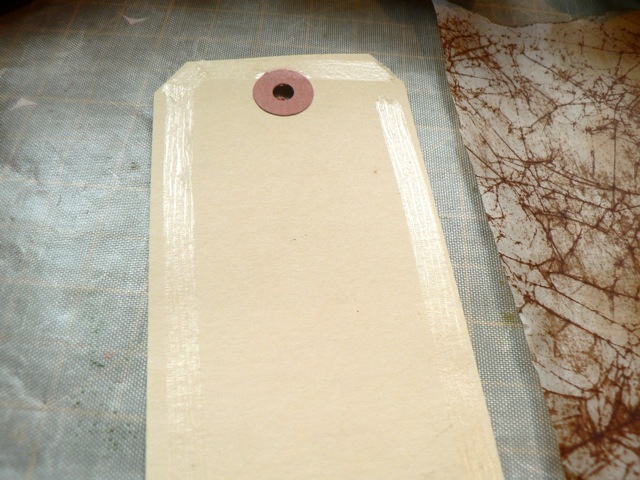 It’s best to apply the adhesive to the tag, rather than the waxed paper. It could rip if you are not careful. Try to get right to the edges – I did better on the right then on the left. 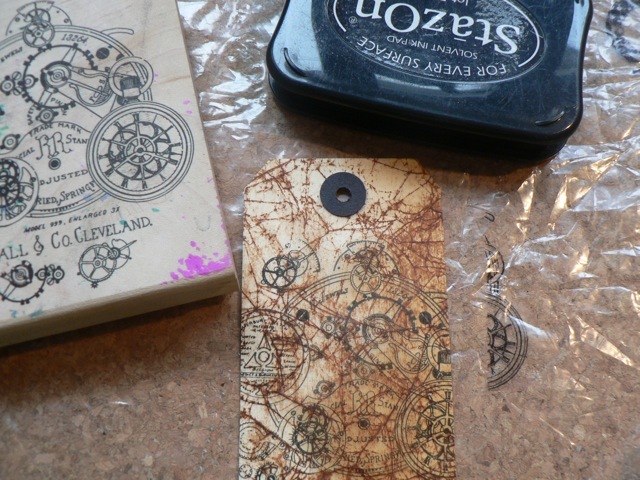 Stick on the waxed paper and trim. I defy you to see any obvious adhesive thru the waxed paper! 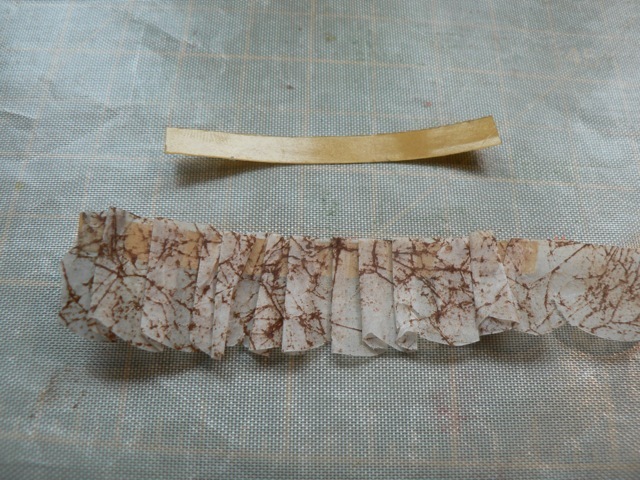 Then I thought back to the tissue tape ruffle I’ve seen and again thought Wonder if….? Yep, it sure does. 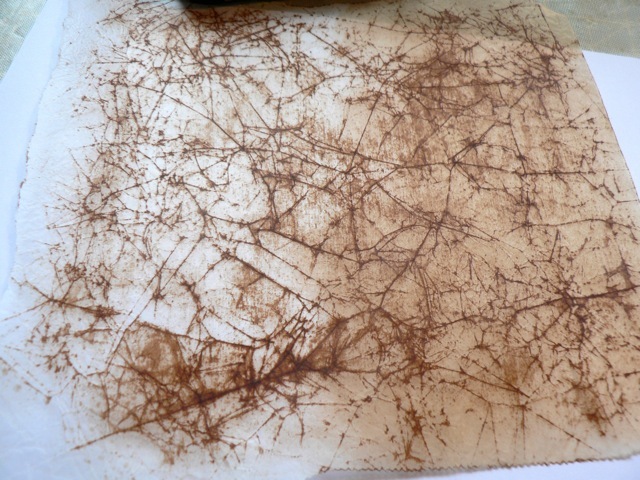 Crumple and ink a strip of waxed paper, as before. Iron. 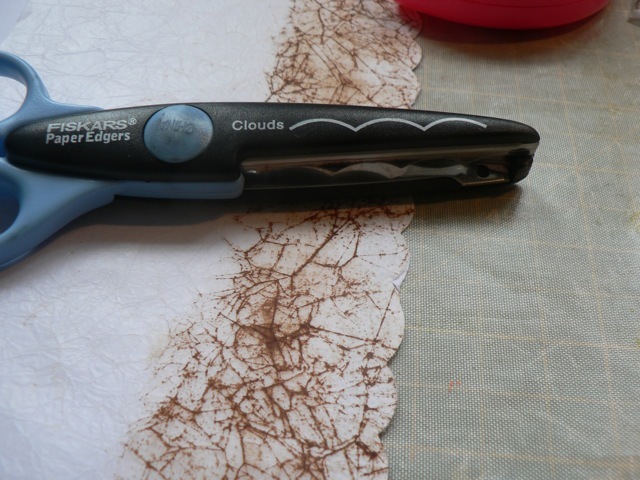 Stick it to a sheet of plain paper and trim with scalloped scissors (the plain paper supports the thinner waxed paper, making the cutting easier. Frankly You could just leave the edge straight – one you ruffle it you don’t really see the scallops much. 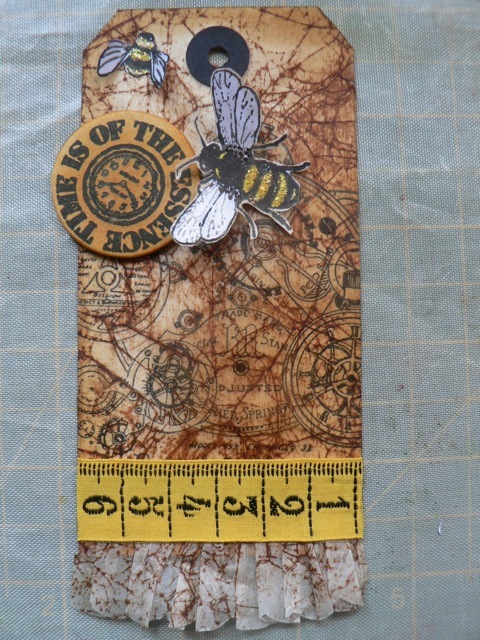 I lay a strip of double-sided tape down, sticky side up, backing still on. Pleating and sticking the waxed paper strip gives me this! I know that was a pretty massive post, but I really wanted you to see how well this works. Get some waxed paper. Have a play. I think you’ll be surprised what you can do with it. 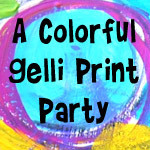 Categories: art, cards | Tags: cards, distress ink, distress stains, stamps, waxed paper | Permalink. This is soooooo awesome!!!! What a great idea. I will have to try out. oops sorry about the caps lock! I need wax paper now 🙂 Thank you for a great tutorial, love the effects. This is great love the finished look. Thanks very much. great stuff MA, you kinda lost me at the iron bit…I have to go upstairs for that! Combine wit the nearly £10 price of the freezer wrap!! 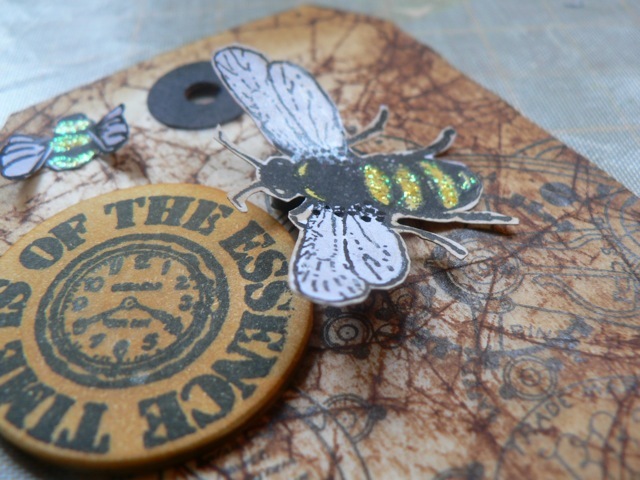 Love the results though…especially the easy to stick-and-not-see-the-glue bit! 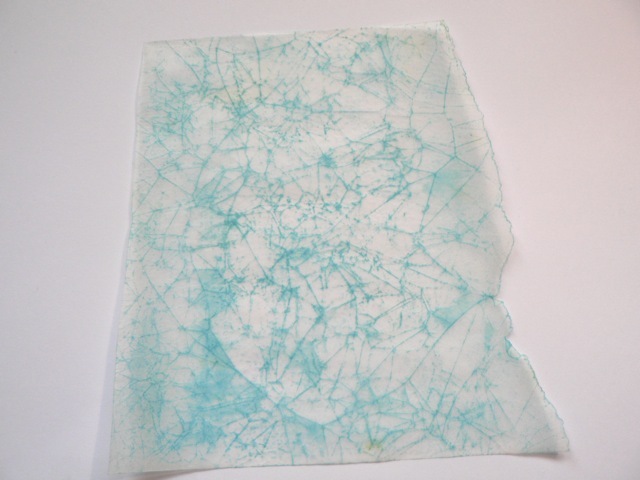 I have been wanting to use wax paper in projects but do not seem to be able to find the product. Is that roll in your picture bought in the UK? Can you help with where to nuy it. I wish I could tell you I bought it here but it was hand carried to me by a USA visitor. I know you can find it at Lakeland http://www.lakeland.co.uk/2395/Food-Saver-Paper-Roll but it’s a lot more expensive than the $2 it is in the USA 🙂 And I’ve not used that particular brand so can’t speak to it specifically. I may buy a roll just to check – frankly you can never have enough waxed paper !! You are too cool for school MaryAnne, thanks for the email, I LOVE it! 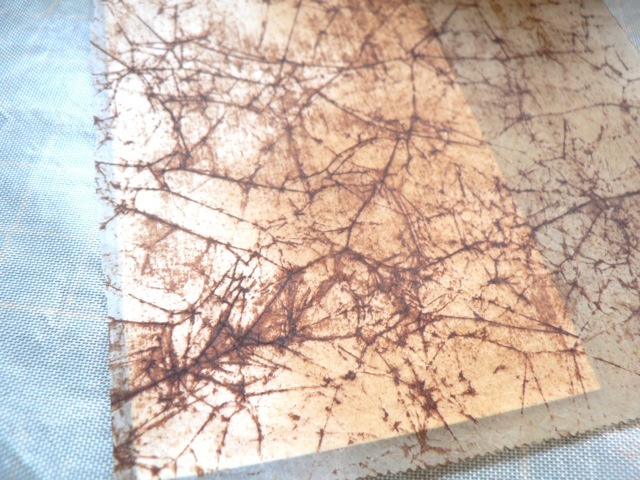 And as for the wax paper – have some in the kitchen I’ve never used. I guess I don’t cook either…laugh! What a great idea and fun one to try. Thanks for sharing. Well, that is a new one to me, have used waxed paper ironed on glossy card to produce a resist but then throw the wax paper away. Thank for the clever idea – will have a play myself.